Discussion in 'General Discussion' started by southsloper, May 7, 2018. Does anyone know what "Port City (BC)" is??? Port City FC will either be in Surrey or Langley depending on where the involved group can get a stadium located. First year may be a temp stadium (like Empire was, not that large though) somewhere. First Crest of the proposed CPL teams - for York 9 FC (named means they represent 9 districts around York). So, I wonder if "Port City FC" has a crest and/or logo already? Port City is a terrible, terrible name. Has anyone, anywhere ever equated Surrey to being a "Port City"? I don't see any scenario in which the team is placed in Langley. If they do put them in Langley it'll be a failure. They have to be in North Surrey, or maybe Swangard. Walking distance from a skytrain. 5k stadium is fine. There is a port in surrey. Its possible they could locate a stadium down scott road somewhere. Its close to a skytrain as well. There was a time the whitecaps wanted to be in that area. Then over train tracks by the port. I guess neither worked out. Still in bc place. I know. But no one knows it as a Port City. North Surrey is the best location. I guess it depends on the availability of land. <Meh> Not ecstatic about "Port FC" and don't have an alternative suggestion. The shirt isn't me but I thought it was funny. Sorry for taking my own thread off-topic! haha, i get it, and i know exactly the feeling and what it's like to be around parents that don't quite get it. as a coach i am accustomed to having to call out, but this last year i pulled away from coaching my oldest to focus on my youngest, as the level of coaching he now gets is excellent. so no more calling out for his games, but other parents on his team did exactly as you mentioned...sideline coaching throughout the game and it is unpleasant and can be annoying AF. one thing that parents should be told at the start of the season is that your instructions a) aren't even heard the majority of the time by your kid or any of the players b) are usually contradictory to the coaches wishes or what's actually playing out in the game c) fly in the face of your kids development...they need to make their own decisions and make mistakes in order to grow! at the start of my coaching season i usually address these things along with the idea that after the game it's best to just be quiet and listen..or wait for your kid to bring up the game later on. when i was a kid the shirt you would see is 'hey coach, relax!!!' and that definitely still applies but these days i swear it's more applicable to parents. I saw a soccer dad one like that the other day. Thought it was funny (though it's also sad, but true!!). I am so fortunate with my teams lately the last few years. They've all been so so wonderful. No issues whatsoever. This is with 3-4 different teams too. Long may it continue! I was engaging with someone on twitter this week who experienced a coach berating it's players - u10 house girls. It sounded quite unbelievable. I have a pretty frank talk with all the parents a few times pre-season in writing and verbally. This, I think, may be helping with my teams not having issues. The other thing that helps is I don't berate my players or the ref at all (of course something slips out here or there, as is unavoidable - I'm far from perfect! I then apologize and don't repeat the mistake that season). 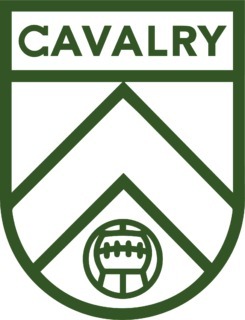 Calgary, AB (May 17, 2018) – The Canadian Premier League (CPL) confirmed today that Cavalry FC, based in Calgary, will be one of the founding clubs to play in the highly-anticipated professional men’s soccer league set to debut in Spring 2019. Halifax now also announced today. Confirms Hamilton, Winnipeg, Calgary, Halifax. Also, so far the crests are amazing (thank goodness!!). Can't wait for the BC announcement (though that name Port City....what a mess that is!! but oh well).